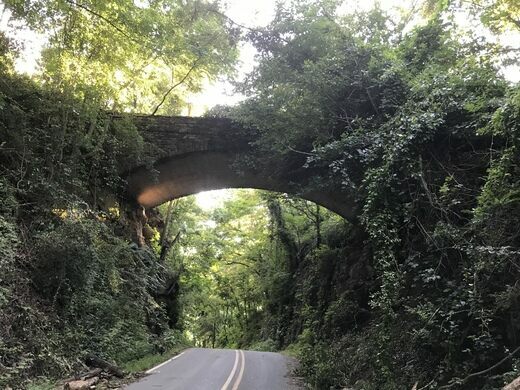 Writer Thomas Wolfe walked under Helen’s Bridge many times while growing up and included it in a passage in his book, Look Homeward, Angel, but it is perhaps the lore surrounding the bridge that draws the most attention. The arched bridge is made of quarried stone and was constructed in 1909 to provide access to the nearby Zealandia Mansion. The legend speaks of a woman named Helen who lived at or near the mansion with her beloved daughter. After Helen’s daughter died in a fire, the distraught mother hung herself from the bridge. Her anguished spirit is said to still appear when her name is called, although people who have attempted to raise the spirit have reported that their car will not start when they try to leave. Every week, a festive public jam session breaks out in downtown Asheville. This giant iron playfully pays tribute to an early 20th-century architectural trend. This rare basilica nestled right in downtown Asheville is an architectural marvel, inside and out. This Virginia railway overpass is said to be haunted by a serial killer in a rabbit costume.